ESI holds the spirit of maître (noble friendship) in the heart of its existence. This space supports and strengthens individuals working with noble intentions across country. We call them lok mitras (peoples friend). There are about 15 lok mitras connected with us from rural and urban India. 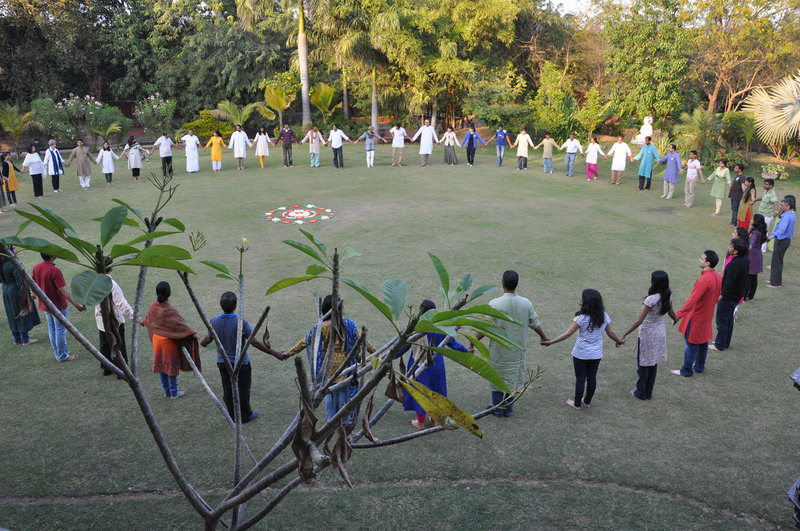 The intention of the lok mitra is to purify the inner being by serving in communities. The purified intention and inner work percolates in the community and creates a space of love and compassion. Once this intention takes root in the local community, the idea for it is to spread its seeds into the universe. Lok Mitra is already holding a noble intention in his heart as he walks into the community, and the maitre space makes a humble effort to offer him the soil of freedom for him to walk the path of his heart. There are many projects happening across the world, but change does not happen with projects. It is through deeper individual connection and love that the society transforms. Lok Mitra literally translates to “friend of the people”. While think-tanks exist to encourage intellectual quotient (IQ), Lok Mitra is designed as an incubator for compassion quotient (CQ). Entrepreneurs are creative visionaries who generate new value. While the world has recently seen a rise in “social entrepreneurs”, Lok Mitra will create a new genre of “generosity entrepreneurs” who manifest new value through love-compassion & service. Lots of people want to engage in “labor of love” projects, but they may be forced to give up on their vision simply because of a few missing pieces. Lok Mitra hopes to collectively provide a backbone of support until the conditions ripen for the project to be on its own. To that end, we provide a values-driven process, a like-hearted community, and some material resources. Who can be a part of Lok Mitra? Service from the heart: Inspired by values that have been integral to our spiritual heritage, many individuals have dedicated their entire lives to serving those around them. Their service to society is combined with the elements of universal goodness and brotherhood. Along this path, they continuously learn, and when they fall, it is their implicit faith in humanity that helps them stand up and connect with others through the heart. These values enable individuals to cultivate into living examples for others. Today’s Scenario: Many individuals working with non-profit organizations possess this same spirit and mission at the beginning of their journey; however, the pressure to meet their responsibilities towards family demands them to contemplate the need for financial security. In order to balance society and service, their focus drifts gradually towards security, to meet their basic needs. As a result they find a secure place within an organization and serve from the confines of their role. Investing in Human Capital: In the recent past, financial capital has tended to flow towards relief work, infrastructure building, basic needs, healthcare, education, and so on due to comfortable structures that organizations offer. But what if, resources were to be invested in human capital. We can find that its impact is multiplied. The personal transformation within an inspired individual can go on to inspire others to serve in their own community. And it is with this context, we propose the idea for a ‘Lok Mitra’. Lok Mitra: Through Lok Mitra we propose to come together and strengthen selected individuals who have dedicated their lives to working for the Social cause. By committing to support one individual for a period between 3-5 years with the financial security they need to cover their basic needs, they will have the opportunity to cultivate their values and represent, a mobile organization. When Lok Mitras move across society spreading their thoughts we are bound to see people around them responding. When people respond, we see hearts connecting and creating a community centered around ‘Love’.